With the mid-size sports utility vehicle (SUV) market expanding across the globe, savvy car buyers are attracted to the lofty driving position and security of a high-rise model combined with the sensible footprint and running costs of a sensible family car. 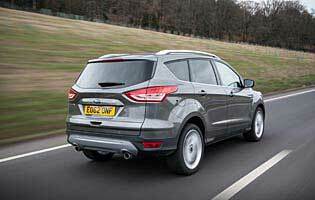 Ford is attempting to build on the success of its second generation Kuga by reinforcing the car's upmarket appeal and car-like on-road behaviour. Just like the model it replaced, this Kuga combines a dynamic exterior design, strong build quality and decent specification into a package that continues to prove popular with buyers. Unlike some rivals, the Kuga has the added advantage of boasting business car appeal alongside family car potential, thanks to its sharp looks and generous trim and equipment levels. Learning from the sales successes of its first Kuga, Ford's second generation effort benefits from more potent yet frugal engines plus a choice of two and four-wheel drive from launch. Diesel power will likely remain the primary engine choice for most buyers, as it should provide the best blend of economy and performance, while fans of auto gearboxes and petrol power are treated to high standard of flexibility and refinement respectively. The inclusion of Ford's six-speed twin clutch transmission for selected models does little to impact consumption, emissions and refinement. Indeed, for some buyers the ability to choose an auto variant is a genuine attraction. Ford doesn't pitch the Kuga as a proper off-roader but as a lifestyle vehicle, which means towing is likely to be a popular use for the vehicle and for many an auto 'box is an essential item of equipment. As befits a car positioned at the upper end of the mainstream market, the Kuga comes equipped with a high level of standard specification and equally high quality cabin trim materials. The is reflected in everything from the high quality audio units available to the car's plush upholstery, soft-touch plastics and long list of model dependent extra kit such as high power headlights, navigation and active safety systems. In high power diesel trim the Kuga proves to be an impressively swift vehicle with sufficient depth of talent to cosset occupants on even the roughest of roads. The Kuga's modern styling and spacious cabin mean its can carry off such diverse roles as a family car and business machine with ease. Playing the part of a high-rise family holdall, the Kuga is hard to beat on paper and in the real world. With the continual development of more economical petrol and diesel engines, Ford has managed to keep running costs down to almost family hatch levels. The car's intelligent all-wheel drive system contributes considerably to this, while the increase in standard kit levels make the Kuga a good value proposition when compared to its closest rivals. There's little danger of clashing elbows in the cabin and headroom is more than adequate. The same can be said of the rear, which will comfortably seat a trio of younger passengers. The glovebox is large and there are various cubby holes in the cabin providing storage options. The flat folding second row of seats and their split-fold action maximise the usefulness of the well-proportioned boot. Factor in the model dependent powered tailgate - activated by waving your foot under the bumper - and the Kuga's versatility is impressive. The Kuga's trip computer provides the driver with a wide choice of information, in addition to accessing the steering modes, while the sat-nav screen is easy to read in a variety of light settings. The cabin has been thoughtfully designed and the main controls and displays reflect this. The only hiccup is in the implementation of the minor controls, such as for the audio system. Lots of buttons confront the user, in the same way they do for Focus and Fiesta owners, which can prove confusing when operating them on the move. 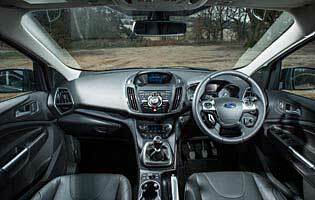 Generous equipment levels combine with good ride quality and a reasonably spacious interior to good effect in the Kuga. Noise levels are kept to a pleasing minimum and the PowerShift transmission smoothes out progress, improving comfort for driver and passengers. Seats are supportive, too. As you would expect with any car at this price point, the Kuga comes with a comprehensive alarm and immobiliser system. Privacy glass is available to shield occupants and belongings from prying eyes, while underfloor storage and generous cabin oddment space provide further useful options for keeping items out of sight. As with the design and performance updates to the Kuga, the car's safety offerings have also been enhanced. There's no shortage of airbags plus the expected traction and stability electronics, and now the Kuga can be had with adaptive cruise control and a Volvo-esque collision warning systems first seen on the Focus. The impressive handling characteristics that make Ford passenger cars so pleasant to drive have been carried over successfully to the second generation Kuga. The car rides well and the diesel units offer an impressive degree of pulling power. The addition of Ford's twin clutch gearbox system is a real bonus, offering seamless shifting for ultra-smooth progress. As a car for families seeking a stylish vehicle offering a decent drive, a quality cabin, plenty of space and a degree of off-road capability, the Kuga is an ideal choice. Big enough to carry a family of five and versatile enough to tackle more demanding jobs in terms of load carrying and light off-roading, it's a solid all-round performer. 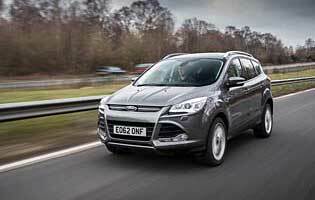 The Kuga isn't an obvious choice as a first car. The updated range is tailored more towards the premium end of the market, pricing it out of contention for most first time car buyers. More suitable alternatives such as the B-Max or Focus could prove easier to drive and park for first time owners. The Kuga's bold exterior styling gives it an instant advantage in terms of road presence and it's one of the most enticing crossover options despite the lack of a premium badge. The well-equipped trim levels are aimed at a more premium sector and this is reflected in the car's strong build quality, too. The Kuga's raised ride height provides a good compromise between off-road ability and ease of access to the cabin. The doors open wide offering good access to the front and rear. The boot's aperture is generous and provides easy access to a flat load space. Depending on the model, Ford offers a remote 'hands free' opening and closing mechanism for the tailgate - move your leg close to the rear bumper - which requires a little practice but offers a useful alternative to the conventional powered opening option of its rivals. The controls in the Kuga are located centrally in a high position on the car's fascia, which makes them easily accessible. Well placed buttons on the steering wheel provide additional access to commonly used audio and telephone functions. The Kuga's bold exterior design carries a range of colours well, and benefits from bolder shades to bring out the various design details. As you move up the trim levels there's more scope and variety in terms of detailed trim accents inside and out. Large alloy wheels might not be the best choice for off-roading but there's no question they do much to enhance the car's appearance, too. There's no question that, where fitted, rear parking sensors take the guesswork out of parking, despite the Kuga's lofty driving position. Further help comes from the car's heavily assisted steering and good-size exterior mirrors. Space saver spare fitted as standard. Petrol engine options - 1.6-litre (150bhp, 180bhp). Diesel engine options - 2.0-litre (140bhp, 163bhp). Transmission options: six-speed manual gearbox, six-speed twin clutch PowerShift automated manual gearbox with manual override. Trim levels: Zetec, Titanium, Titanium X.